This module allows to create quickly a projection line based on fixed cycles. The peculiarity of this module is that it allows to perform this work extremely easy. This module works fantastically fast because I used the new algorithms here. If you need to get the final forecast (the forecast based on the model that uses the WHOLE available price history), simply set Learning Border Cursor (LBC) on the last price bar clicking this button ; in a second the program will perform a huge amount of calculations and will update the projection line. Now let me explain what the program does during this second. Look how the spectrogram is changing when you change the position of LBC. 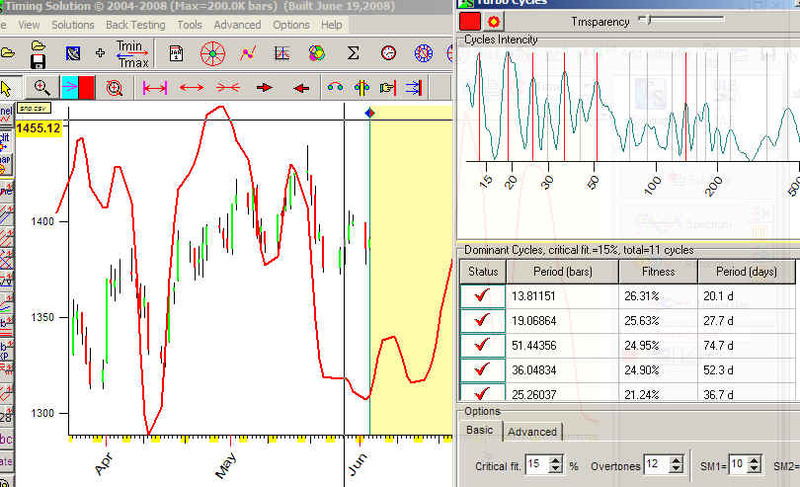 It displays a period for each cycle and some other parameter, "fitness". This parameter is a forecasting ability of this cycle. ("Fitness" for multiframe spectrum corresponds to Bartell's significance test for classical spectrum analysis.) The higher fitness value, the more significant cycle is. 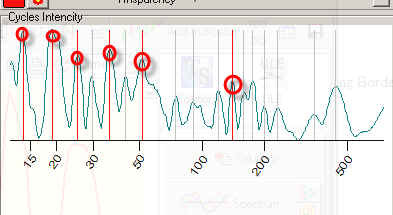 The program immediately updates the projection line taking into account a new cycle (42.88 bars cycle shown). Critical fitness - allows to choose the cycle by fitness criteria. If you set this value to 50% you will get 1-2 dominating cycles. I recommend to vary this parameter in the range of 5-25%. Overtones - allow to include sub harmonics to the main cycle. 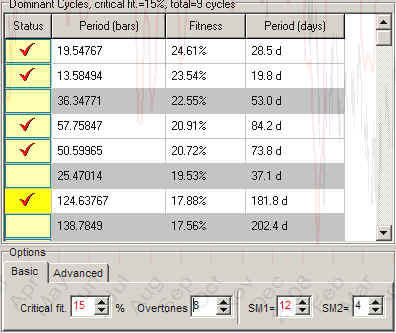 For example, if we analyze 100 bars cycle and use four sub harmonics, the program will analyze 50, 33.3 and 25 bars cycles together with 100 bars cycle. Remember that setting SM1 parameter to 2-3 gives the spectrum very close to MESA (maximum entropy spectrum) , while setting SM1 higher than 30 gives the spectrum that is very close to classical Fourier transform. Multiframe spectrum lies between these two; it is the best compromise between the noise (Fourier) and the concentration on short term cycles (MESA). SM2 parameter is responsible for forecast horizon. If you set this value small (1 - 4), the program will concentrate on a short term forecast; increase this value to create a middle term forecast. Max amount used dominant cycle - shows how many cycles the program uses to generate the projection line. As I said above, you can include/exclude these cycles manually. Though I do not recommend to use too many cycles. the program recalculates the periods of dominant cycles automatically.